(TibetanReview.net, Feb12, 2018) – China’s reprimanding of South Africa for allowing a visit by the political leader of the Central Tibetan Administration (CTA) has been strongly criticized by the country’s main opposition Democratic Alliance MP Sandy Kalyan and the Inkatha Freedom Party’s Chief Whip Narend Singh. Both have also criticized the Chinese orchestration of a protest against the visit and their own government for its “stern” warning to the visiting exile Tibetan leader to keep a low profile. 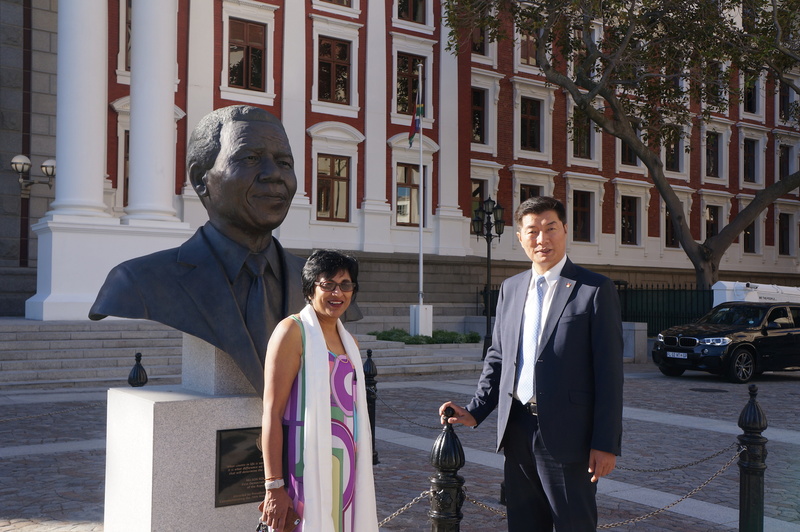 Calling on China to stop “overstepping” on South Africa’s sovereign rights, Kalyan has said in a statement, “The reaction by the Chinese Embassy at the visit to South Africa by Dr Lobsang Sangay, the President of the Central Tibetan Administration is so over the top and quite ludicrous.” She has added that Dr Sangay had been invited by Hon Buthelezi, President of the Inkatha Freedom Party, to attend SONA (State of the Nation Address) by President Jacob Zuma. She has equated China’s threat to stop investing in the country for having allowed the visit to “a child throwing a tantrum” and dared it to proceed with that threat. And she has condemned the protest orchestrated by the Chinese embassy in South Africa and led by its officials with a rented crowd of about 30 persons against the CTA president’s address at Stellenbosch University and applauded the fact that the address went ahead in spite of it. The Inkatha Freedom Party also called the Chinese embassy action shameful in a press release Feb 10. “Yesterday’s staged [Chinese] Embassy protestations against the president of the Tibetan government in exile, Dr Lobsang Sangay, when he visited the law faculty at Stellenbosch University will bring nothing but further shame and disgrace to China as it continues with its policy of oppression against the people of Tibet, no matter where in the world they may be found,” the party’s Chief Whip in Parliament, Mr Narend Singh, was quoted as saying. He has also called it a shame that his government was continuing to kowtow to the Chinese government, “sacrificing its own constitutional values on the altar of Chinese foreign policy appeasement”. Singh has said his party will continue to support Tibetans in their call for regionalized local autonomy and freedom from Chinese oppression in Tibet. “We urge dialogue between China and representatives of the Tibetan people to resolve issues. Might is not always right. We have seen this in our own South African situation,” he said. 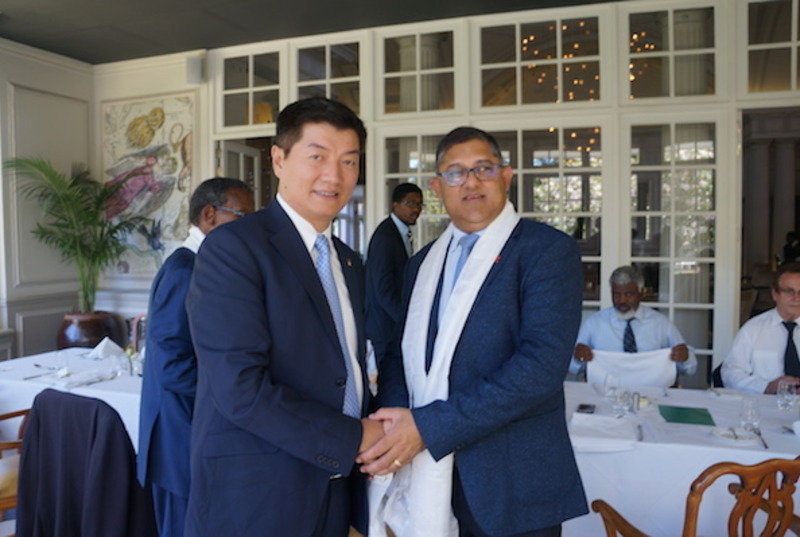 Kalyan too has expressed anger at the South African Department of International Relations and Cooperation’s alleged “stern” warning to the Office of Tibet in the country, demanding that Dr Sangay keep a low profile. She wanted the department to clarify the meaning of the warning and on China’s assertion that the South African Government had made a promise not to allow Tibetans to South Africa. “Clearly this is a gross violation of the Constitution of our country and has to be challenged,” she has added. Kalyan has been an MP since 1999, has served as the Deputy Shadow Minister on International Affairs, and is a Member of the Pan African Parliament where she chairs the Committee on Rules, Discipline and Privileges. Both Kalyan and Singh had attended the Five-Fifty Forum organized by the CTA at Dharamshala last October.